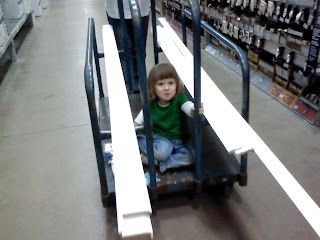 This past weekend the family took a trip to Lowes to pick up some building supplies. We were getting some new trim for Alyce's new room. Because we were getting trim we needed to use a different cart than normal. Alyce was a big fan of this cart as she got to go surfing at about one mile an hour. We even saw Gideon's dad Josh while shopping. 0 comments on "Fun at Lowes"